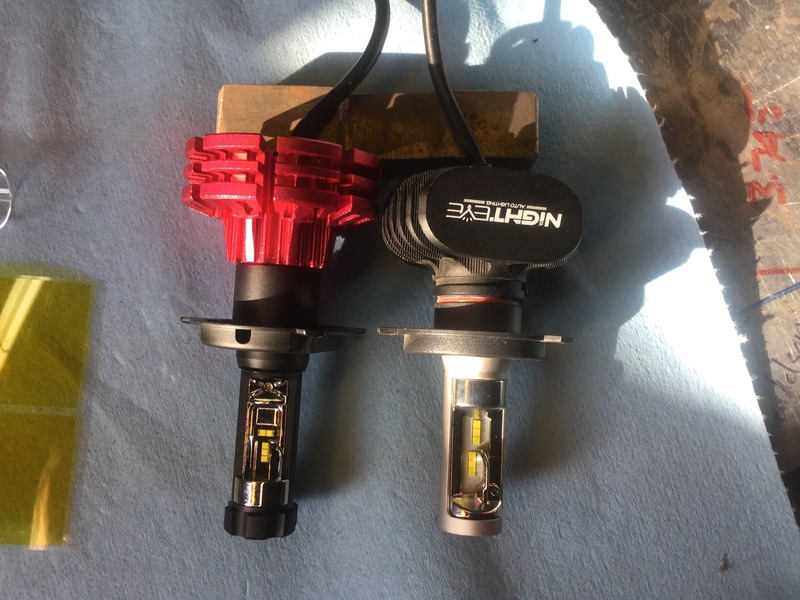 Last winter I installed some LED H4 bulbs into my e-code lamps. Here is the link to the last update about them. 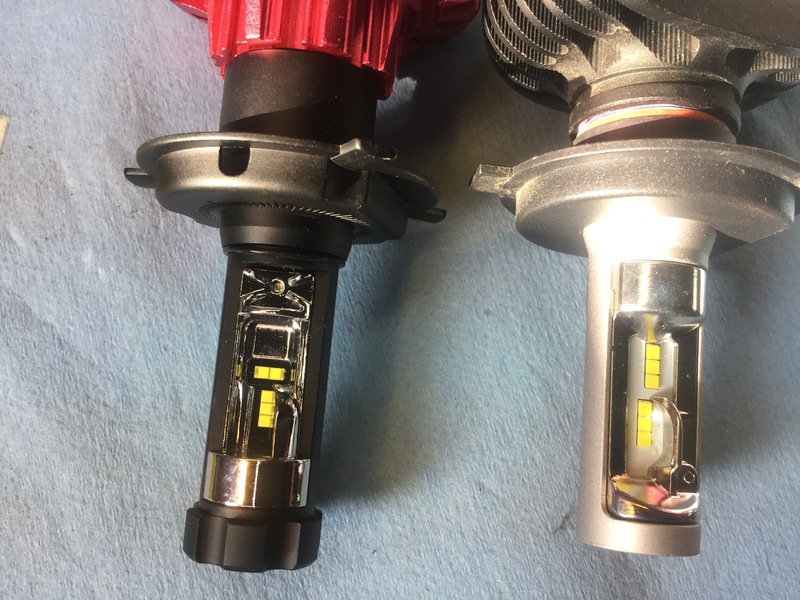 If you haven’t read that post, and the original install post referred, and you want to know my reasoning behind trying the bulbs, I urge you to go read them. Oh and another proviso, I bought both the original and these new versions from Banggood. They weren’t given to me. My opinions about the bulbs are not influenced by any freebies. So why did I buy new bulbs? There are three reasons. First one is I was not happy about the radio interference they caused. The interference affected weaker fm stations. It was annoying. Secondly, I wasn’t satisfied about the high beam projection. The beam seemed to get lost at distance. On the other hand the low beams are so good that I didn’t need the high beams as often as I did with halogen bulbs. Again, please refer to the post linked above for more on beam patterns. 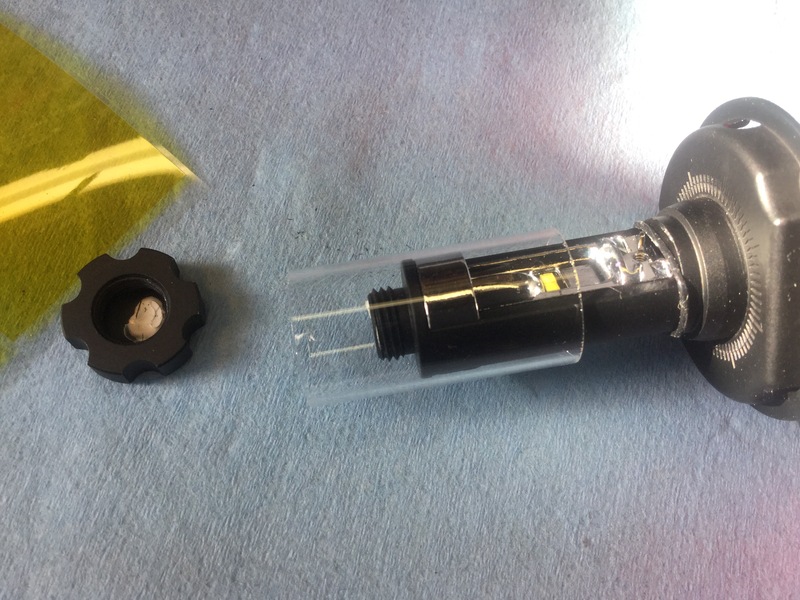 The third reason for trying another set was that these bulbs come with optional gel filters, yellow. I was curious about how they would work. 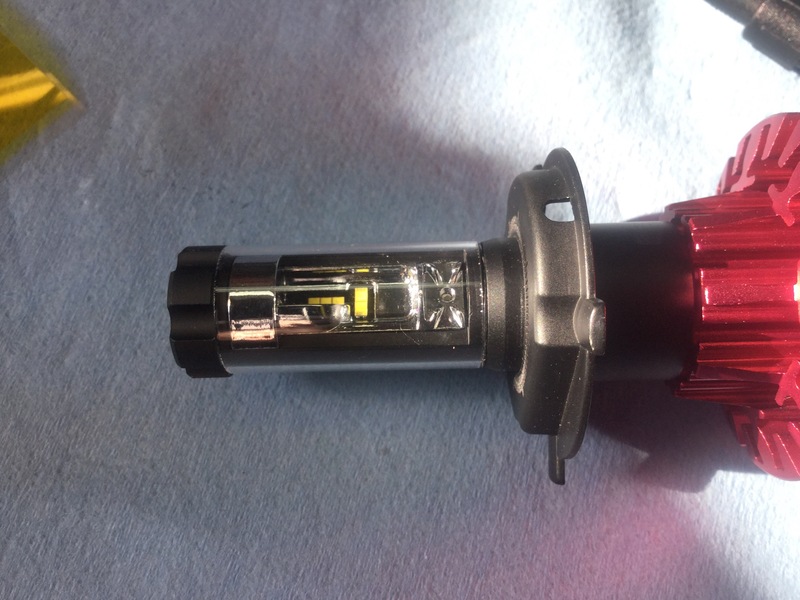 Ok then, here are the new bulbs, and here is a link to the product page. Link fixed, sorry about that. Similar to the older model ( on the right ) but with some important differences. Right away you see the heat sink is different. I think that the older bulb has some electronics in the base, the new ones have a separate box of electronics. And notice the difference in the led element, size, number, and orientation. 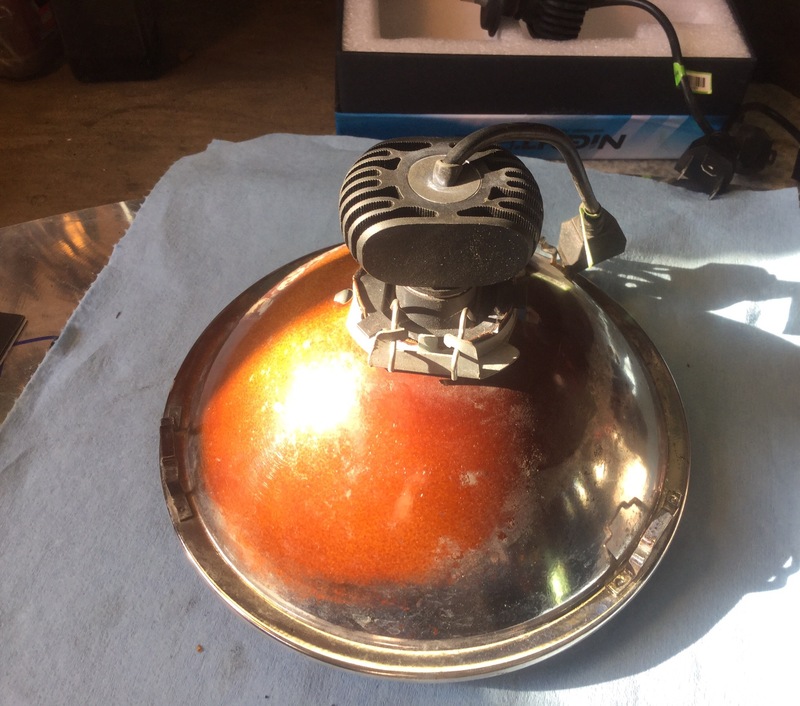 I’m going out on a limb and say that the newer bulb has the LED elements arranged to more closely mimic the filament positions in a halogen H4 bulb. Interesting that the elements are smaller and fewer but the bulbs are advertised as 30W each compared to the 25W of the older bulb. The new bulbs have a metal box in the power line. I was surprised it was metal, made me hopeful that the radio interference issue might be fixed. Popped the cover to have a look. 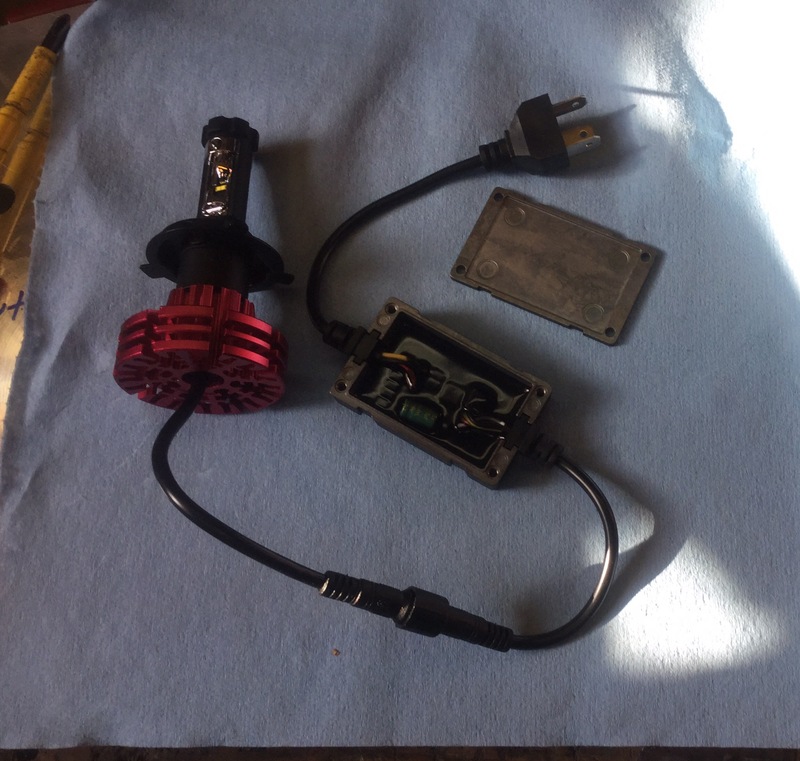 Components are potted, only a cap showing. I was impressed, I started to think that these bulbs were surprisingly well made. The power line has a very positive and o-ring sealed connection. This probably eases some installs, makes no difference in the van. 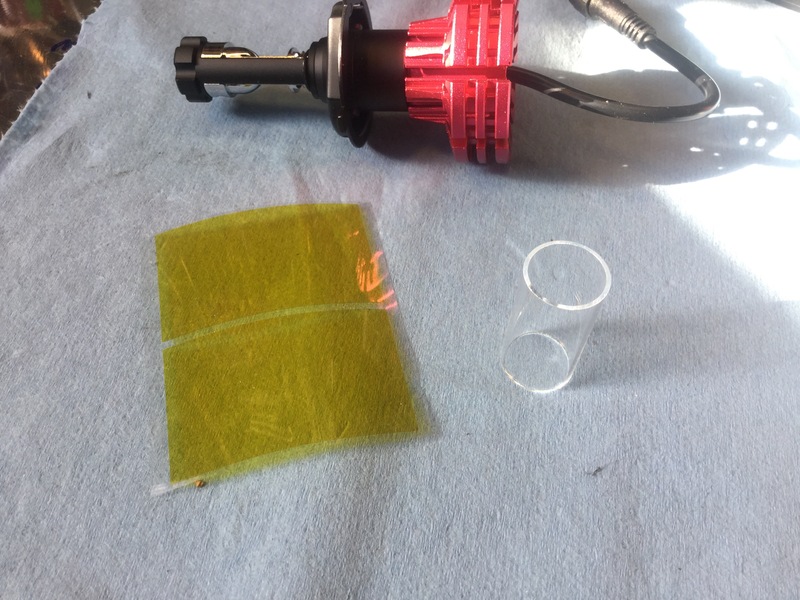 The filters, according to the instructions, are self adhesive and applied to the glass tubes. I’m holding off on the filters for now, but I did install the glass tubes. The end of the bulb unscrews and the tube slips down and seats against an o-ring. O-ring wasn’t in correct position in that last pic, but here we go fixed. Another interesting feature is the rotationally adjustable mount. The three tab base is held in place by two set screws, and it can be rotated. 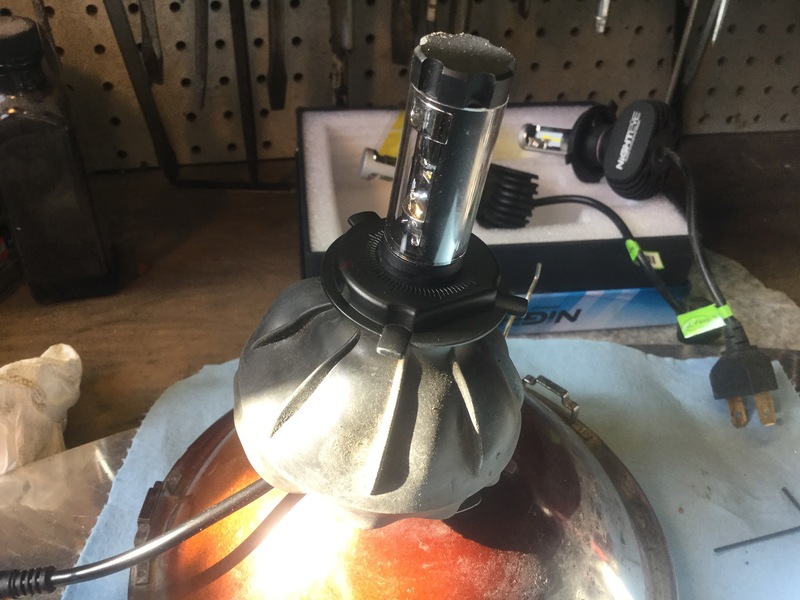 There is a degree ring on the base and a witness mark on the bulb body. I did not change the orientation, I’ll wait for some night testing to see if it’s needed. I’m only guessing right now about what effect the rotation would give. Time to pop them into the lamps. The older bulbs thicker bulb body didn’t let me install those rubber boots, but the new ones did. 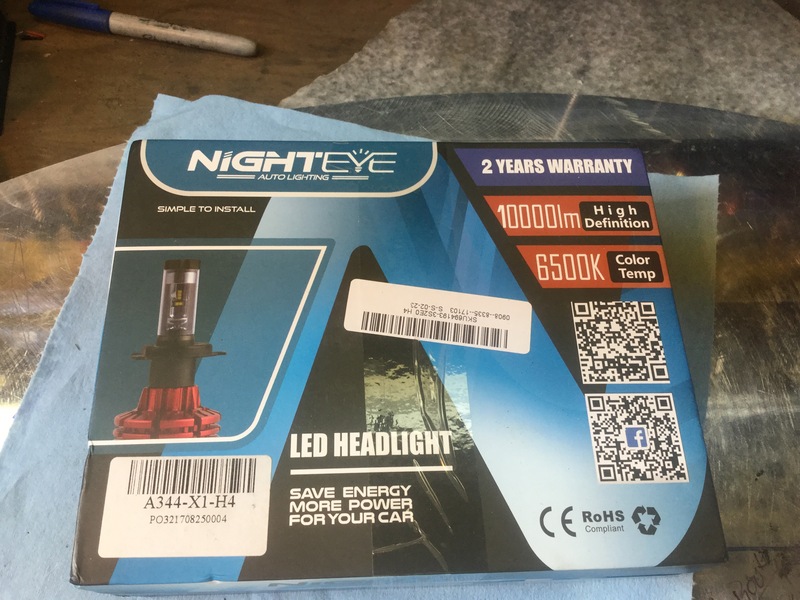 Here is new bulb without boot. 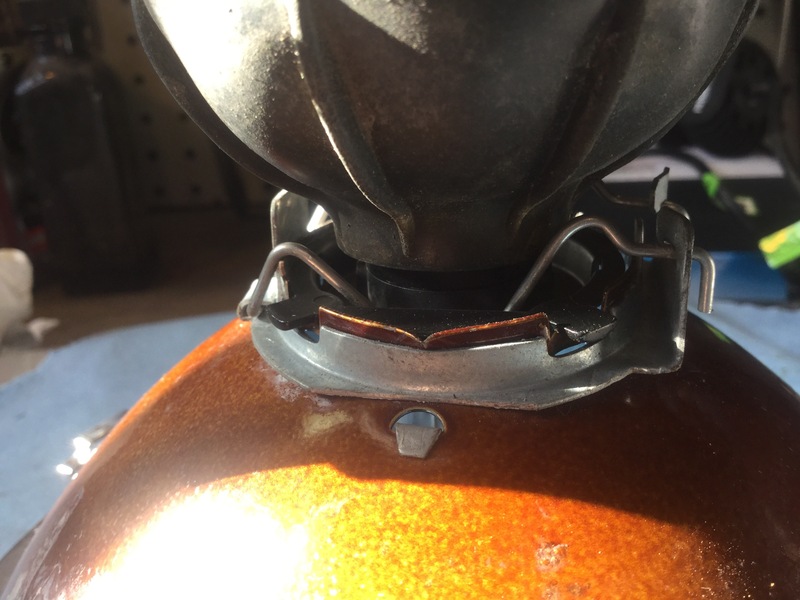 If you remove the three tab mounting base you can push on a boot and then reinstall the base. The boot is everted here, makes it easier to get at the set screws. Keep the boot rolled back and carefully get the retaining wire bails clipped in. Ok, so I actually installed one lamp last night. Right away I saw that the beam pattern on the garage wall was tighter, both low and especially high beam. The radio interference problem was still there, grrr. But today, with both bulbs in, the interference problem has disappeared! Yes, that’s right, weak fm stations now back on the menu. I’m really chuffed about that. 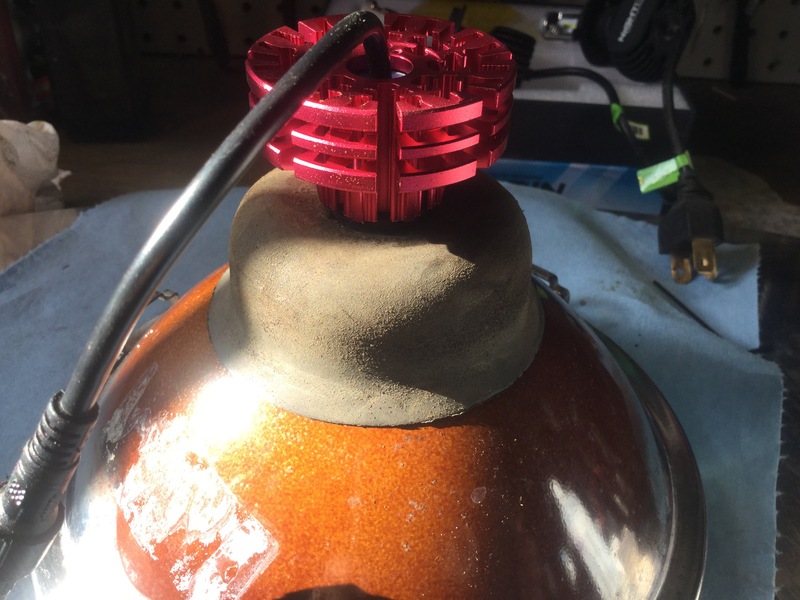 Next to do is swap one of the old LED bulbs back in and do a comparison, take some pics etc. So far I’m really pretty impressed by the build quality of these bulbs, especially for Can$64. This entry was posted on October 17, 2017, 2:27 pm and is filed under vanagon, vanagon mods. You can follow any responses to this entry through RSS 2.0. You can leave a response, or trackback from your own site. 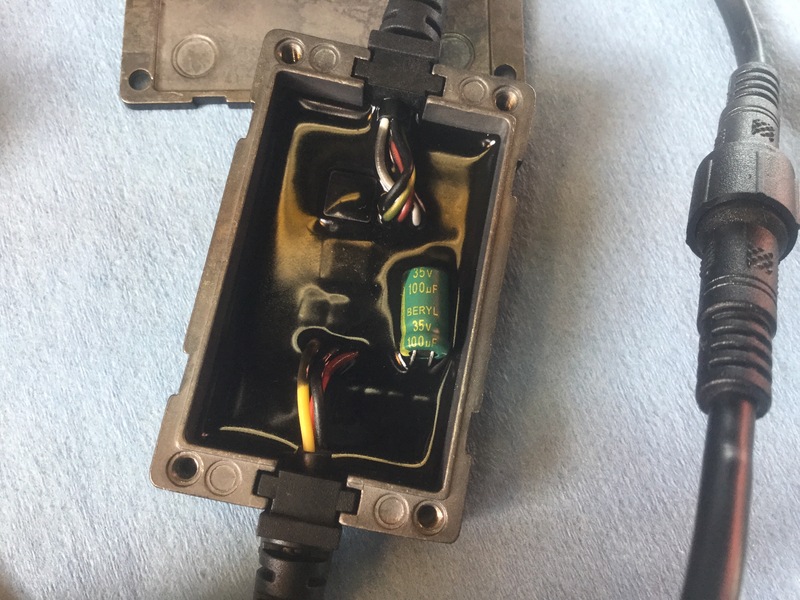 Hi Albell, I just had a bulb go out in my Syncro, and it was cause for revisiting my decision to stay with high wattage halogen bulbs, relays, and European rectangular housings, since I already have all that. 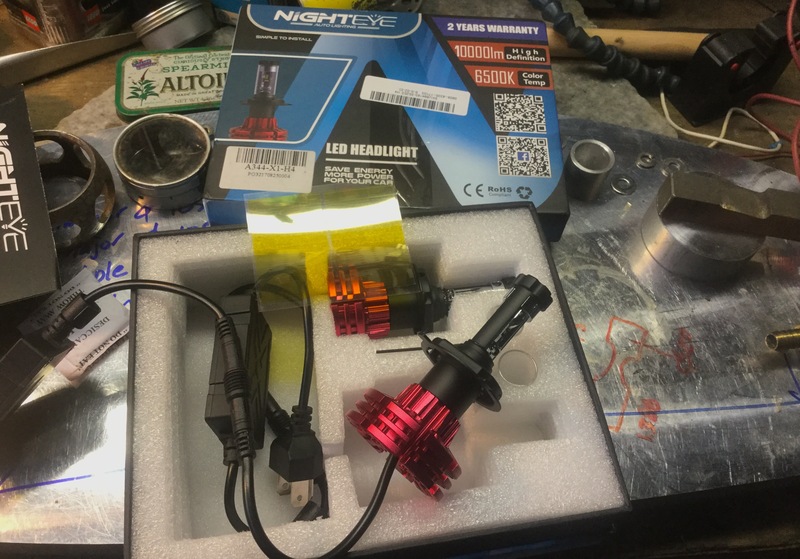 I figured maybe LED’s were working out OK with you, and I had seen a Jeep with some awfully bright round LED conversions the other night. These were the sort of lights that silhouetted my van against overhead freeway signs even as I approached as the lead car with my own lights on. While their beam pattern was obviously atrocious, and a dangerous highway nuisance, I was nevertheless impressed with developments in LED light output. 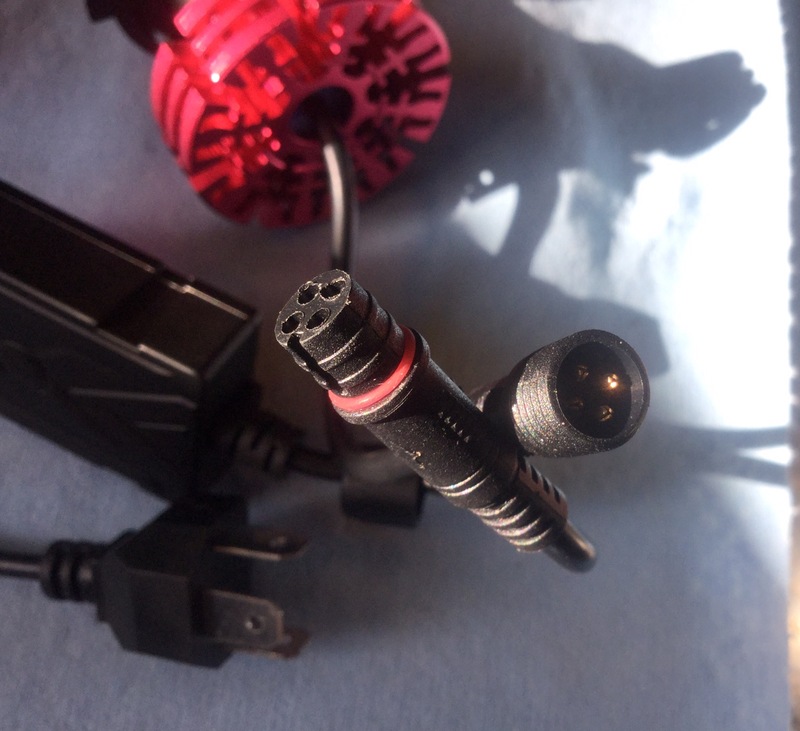 My main remaining concern with trying an LED conversion is that my Syncro is my transport to skiing elevations all winter, and I worry the LED’s seem designed to emit most of their waste heat from behind the reflector. Even my halogen low beams rapidly melt snow into steam in heavy snowfall conditions, during which I cannot keep the windscreen clear. Since you live in a snowier climate, could you comment on the effectiveness of LED’s in keeping your headlights from icing? Yeah know what you mean about those firehose spray type led lights. Last year I didn’t make any snowy winter trips in the Syncro. And we only had about a week of snow at home. Maybe -10C or so? In falling snow and at those temps I didn’t get any build up. But I’m with you about the concern for that. I’ve had build up even with the halogens, around and a bit onto the light. Heavy wet snow rather than cold dry stuff. So I can’t advise you on that. These LEDs didn’t have atrocious bounce back in falling snow. But the high beams did get absorbed and also a bit of bounce back in mist and light fog. It’s funny, thought falling snow would be an issue, but not so much. Well not any worse than halogens. Awesome light pattern and ZERO RF interference. 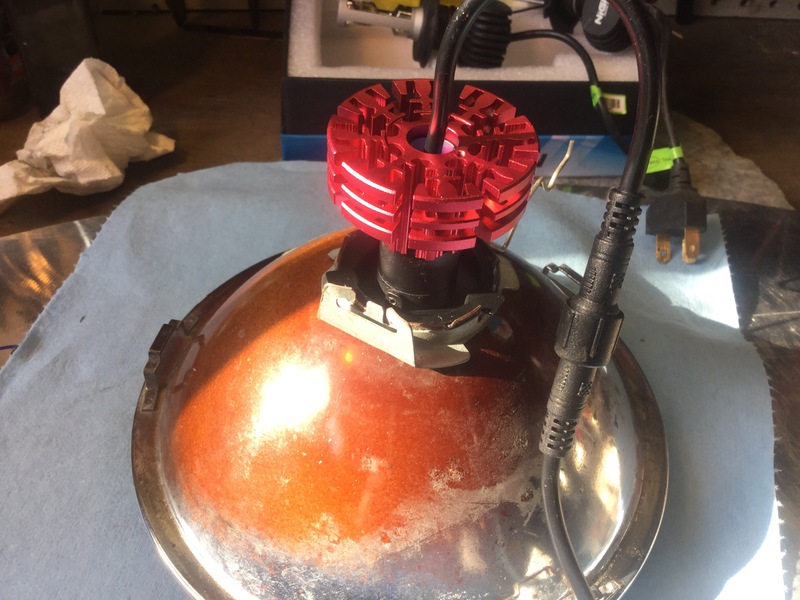 Every other LED brand I’ve tried has interefered with my FM radio and/or my 2 meter ham radio. These don’t. Pictures of light output on Otto’s facebook page.